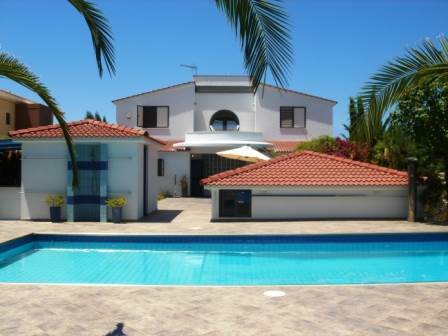 Sea Caves, Paphos - This fantastic villa was designed by a well-renowned architect. The aim was to create a stunning contemporary home with a subtle blend of Art Deco features throughout. The precise architectural structures, the use of space and light, and the clean lines are easy on the eye and 'state of the art' technology has been built in with Cyprus lifestyle in mind. The ground-floor features a spacious open plan living area, divided into distinct areas. The lounge area is transformed seamlessly into an impressive cinema room by the touch of a button with remote controlled blinds, projector screen, and built-in surround sound system. All technology is controlled remotely including the flush fit gas fire, built-in ceiling A/C units and mood lighting sytem for the house and garden. The stylish kitchen is superbly equipped with granite worktops and Meile appliances, combination oven & microwave, built-in coffee machine, double hob including fryer and griddle system. All bathrooms are fitted with high quality finishes, including Grohe electric taps and wall hung toilets. A double granite staircase leads to the first floor hallway, study area, and impressive balcony at the front of the house with wonderful sea views. Two large double bedrooms, each with en-suite shower room, lead to a semi circular balcony from which there are stunning mountain views. The fourth bedroom can be used as a self-contained studio, staff quarters, guest accommodation, or a gym/games room.